A previous version of this story falsely labeled Sitsa Latour as the band’s drummer and Eloise Turner as lead guitarist. Sitsa Latour is the band’s bass player and Eloise Turner is the band’s drummer. A previous version of this photo caption misspelled keyboardist Jasmine Scrivner’s name and incorrectly ordered the musicians. The proper order from left to right is Jasmine Scrivner, Josephine Leclerc, Eloise Turner, Brian Latour and Sitsa Latour. 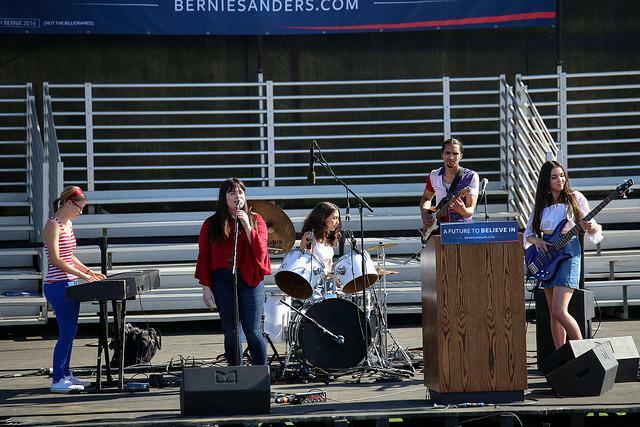 A high school band and self-professed group of “die hard Bernie fans” performed six original songs at a Bernie Sanders rally at Cal Expo Monday. The Love Defenders is a band made up of five members who began performing together five years ago. “Our inspiration comes from Etta James, James Brown, Shuggie Otis, and Earth Wind and Fire,” said 16-year-old Sitsa Latour, the band’s bassist. Latour’s father introduced her to the “good old (1970s)” as a child and she’s been playing similarly influenced music ever since. The band was originally formed when the father of Eloise Turner, the band’s drummer, influenced the group of students to collaborate. “I’ve been blessed to be able to watch them grow and perform,” said Russ Turner, Eloise’s father. The band usually performs at teen festival events, local coffee shops and the Sol Collective art gallery in downtown Sacramento. Its next performance is on Sunday for Sacramento’s Young Feminist Alliance at the Brickhouse art gallery. “It sounds generic and cliche but Bernie is for the people, he fights for us,” said Latour. The only band member eligible to vote is the lead singer, Josephine Leclerc. Even though the rest of the band members aren’t eligible to vote, they still voiced their opinions and their love for the Democratic candidate. All of the band members plan on going to college in the future, “so a vote for Bernie ensures our futures will be protected,” said Leclerc. 4 Comments on "High school band performs at Bernie Sanders Rally"
The keyboardists’ name is Jasmine Scrivner. and Sista plays bass, Eloise is the drummer. Nice job Shiavon. I hadn’t seen this when it was originally published. Thanks for writing about the Love Defenders! That was a fun event to be a part of!